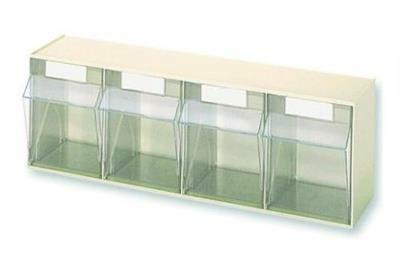 Storage system MultiStore white made of highly impact resistant plastic. Tilt bins made of crystal clear PS. For small components and accessories e.g. in industries; hospitals and laboratories. Dust-free and clean storage of contents. Multifunctional for individual storage solutions with 4 tilt bins. "External Dimensions (WxDxH): 601 x 171,5 x 206mm"
"Dimensions (WxDxH): 125,5 x 128 x 133,5mm"